Thea had been interested in archery for a while but was told she was too young. She went on an outward bounds school trip and finally got to have a go and from then on was determined to pursue the sport and find a club to join. Her coach instantly saw she had an ability for the sport and Thea went from strength to strength. 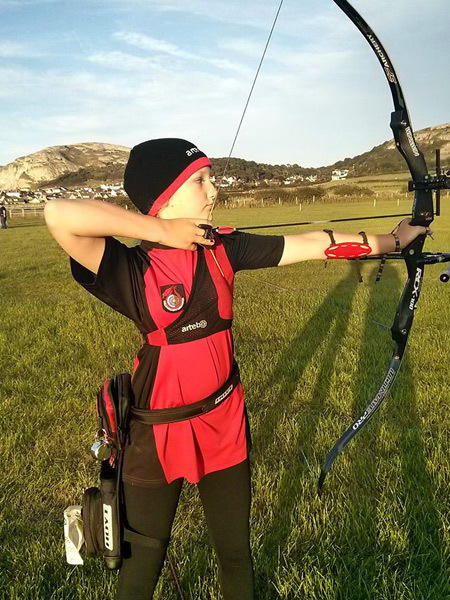 Thea has shot for her County and Country Teams each year and is a member of both the Welsh and GB Regional Academy. She is determined and trains hard to reach her goal which is to make the GB team and represent Britain in the future. Since September 16, Thea has gained a place on the GB Confirmation Academy and is coached by Naomi Folkard and Richard Priestman, both Olympians. Thea has been working very hard during the indoor season, completely changing her technique. Thea is currently in contention for the European Youth Championships in Croatia this July and is attending a series of selection shoots to gain her place. She wants to represent GB and as dedicated as ever to achieve her goal. Thea's scores are improving all the time, only last week end she surpassed a British Record at a tournament, however, she can only claim her Gwent and Welsh Records as the organizers did not apply for UK record status. This is the only age related shoot she will be doing this year as she now has to compete at a minimum of 60M.